If Foxcatcher wasn't based on real events, it'd work great as an inventive restaging of Billy Wilder's Sunset Blvd. Like the earlier film, Foxcatcher deals with the increasingly strained relationship between a young man (in this case Channing Tatum) and an older patron (Steve Carell) which sees the former being more or less confined to the home of the latter in pursuit of shared glory. Swap out screenwriting for Olympic wrestling and the stories match up so well that you could imagine Wilder and Charles Brackett manipulating the real-life figures behind the scenes. The film begins with Mark Schultz (Tatum) at a very low ebb. A gold medal-winning wrestler and former World Champion who has always been overshadowed by the efforts of his older brother Dave (Mark Ruffalo), Mark trains relentlessly but appears to be in danger of not being accepted on to the American team for the 1988 Seoul Olympics. Things look likely to turn around when he is approached by John Du Pont (Carell), a billionaire and wrestling enthusiast who wants to create a world class wrestling team on his family's estate, known as Foxcatcher Farm, built around Mark and his brother. While Dave is initially unwilling to move his family for the sake of a job, even a highly lucrative one, Mark is more than willing to up stakes to live at Foxcatcher. 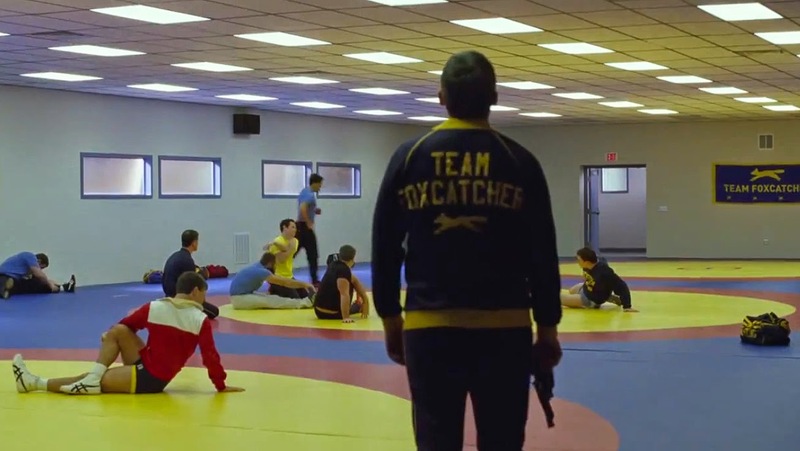 Foxcatcher is a story about class. Though set in the 1980s, and director Bennett Miller has been developing the film for a better part of a decade, its depiction of John E. du Pont is clearly informed by contemporary concerns about wealth disparity and the cloistered privilege of the one percent. As played by Carrell, du Pont is an awkward, pathetic creature who wants to be taken seriously by his domineering mother (Vanessa Redgrave) and who believes that he can achieve that by creating a world class, Gold medal-winning wrestling team. There's some sympathy to be drawn from such a naked desire to be seen as worthwhile, rather than as someone whose value is dependent on their inheritance. At the same time, his efforts to realise that worth - including a scene in which he takes part in an over-50s wrestling competition and wins because he quite clearly paid his opponent - are so cringeworthy that it's hard to sympathise with him too much. Carrell's years of experience playing that sort of awkwardness for laughs on The Office comes in handy in portraying du Pont, who comes across as a version of Michael Scott that people have to tolerate, whether that means pretending to listen to him give talks on very elementary wrestling moves or doing lines of cocaine on the way to a benefit, because he's the one paying the bills. Foxcatcher is a meticulous study of how wealth inoculates against madness. The bubble created by his money prevents du Pont from seeing how off-putting he is because a lifetime of privilege makes him assume that he will get everything and anything he wants. The most telling example of this is his response to hearing that Dave won't come to Foxcatcher regardless of how much he is offered; he displays complete bafflement, like Mr. Burns trying to look up the meaning of "recycling." That works both ways, though, since that bubble also makes those around him assume that he's just eccentric, as opposed to potentially dangerous. He's a distinctly American figure, an apex of WASPy privilege, someone for whom "no" is simply not an option. Contrasted against Carrell's studied mannerisms and stilted delivery is Channing Tatum, who gives a career best (so far) performance as Mark Schultz. Tatum plays Schultz as a man who's graceful and spry in the ring but barely articulate out of it. Every moment he's on screen, he radiates potential energy, a sense that he is seconds away from smashing everything in his sight. It's a spectacularly physical performance that reminded me of De Niro in Raging Bull and Tom Hardy in Bronson. This is a sentence that I could never have imagined writing a few years ago, but Channing Tatum really was robbed when he wasn't even nominated for an Oscar this year. He more fully embodies the frustration and ambition of his character better than pretty much any actor I saw in a film from last year. Foxcatcher also represents an evolution of Bennett Miller's directorial style towards a kind of ambient storytelling. Some of that was on display in Moneyball, another film that was sport-adjacent rather than directly about sport, but this feels even more subdued and contemplative than anything he has done before. Like Brian Eno's work, Miller's film is marked by subtle shifts in tone, without any big crescendos. It maintains a mood, then modulates within it. It's for that reason that the most ominous image from the film's trailer, of du Pont walking into the gym brandishing a gun while calling Mark's name, is actually one of the most innocuous in the context of the film itself: Miller shoots the entire film with an even dread that suggests Something Terrible could happen at any time. Even though it rarely does, that uneasiness is pervasive, and is punctuated by playful moments such as a scene in which du Pont shows up at Mark's house in the middle of the night and his face is framed in a window so that he looks like Max Schreck in Nosferatu. It's moments like that which reveal the Gothic underpinnings of Foxcatcher. Those shifts allow the story to encompass allow Tatum, Carrell and Ruffalo to switch between being lead and supporting characters depending on what the scenes require. Initially the story is about the friendship between Mark and du Pont and how it sours, but at a certain point it becomes about John's relationship with his mother, who views his interest in wrestling as lowly and unworthy of a scion of the du Pont dynasty. There's a delicious irony to her attitude, which the film hints at without hammering it home too much, since there's a strong similarity between John's wrestling obsession and his mother's love of horse racing. In both cases they use their resources to fund a dilettantish interest in a sport where others do the hard work for them, primarily because they are too old to engage directly themselves, and they both collect fine specimens that they set to work on the same farm. The aforementioned scene in which du Pont and Mark go to a benefit feels like an owner showing off their prize stallion, while du Pont's actions towards the end of the film are certainly in keeping with those of an owner who sees no further value in an animal. There's a casual cruelty inherent in both generations of du Ponts, it's just that only one of them focuses it primarily at other people.